Kodatex are offering a unique and exciting opportunity for independent sales professionals to represent their company and sell their revolutionary bespoke art production services for use across a wide variety of industries. The following interview with Bardia Khosravi (CEO of Kodatex) will give sales reps an insight into the workings of the company and the opportunity being presented. You can also apply to work with Kodatex via their exclusive listing on CommissionCrowd (linked below). Qn. Where did the inspiration for Kodatex come from? Bardia: Kodatex Artwork was inspired by a question that struck me while completing my graduate school project on AI (Artificial Intelligence); What would it take for a computer to create artwork? Ever since, my utmost effort has been devoted to developing a system that enables computers to create aesthetically pleasing images using artificial intelligence principles. We subsequently developed a powerful software that creates artwork through a simulation of the process of evolution. Similar to the theory of evolution, and to nature, populations of artwork are bred and evolved. Every artwork embeds a DNA (artificial mathematical DNA) enabling the software to perform natural selection on the more aesthetically pleasing images. In other words, similar to nature, the more fit images survive, reproduce and evolve resulting in the creation of a family of artwork with desirable aesthetic features. We believe that by exploring nature, employing mathematics and the powerful tools that computers provide, it is possible to create aesthetically pleasing artifacts that was never thought of nor existed before. Artwork created by Kodatex is unique, authentic, and can be customized to any resolution and size to fit any object and space. 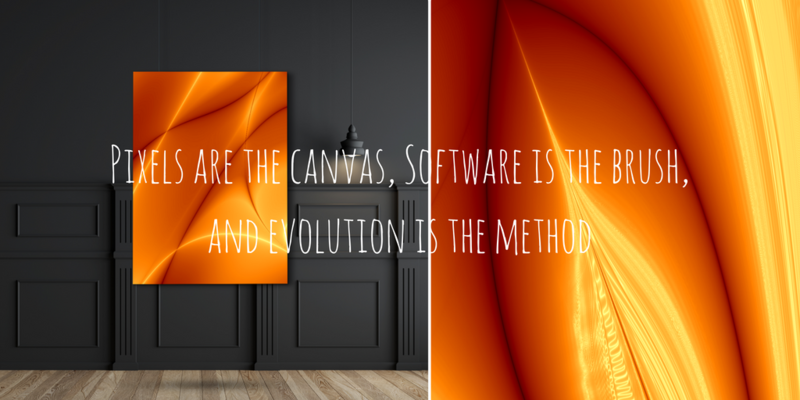 For us, pixels are the canvas, software is the brush, and evolution is the method. Bardia: We've developed unique and customized artwork for a number of medium to large corporations located in Canada and overseas. The specifications of these artwork are based on the client’s requirements in order to be incorporated into their executive meetings rooms, office environments and reception areas. Kodatex has also exhibited artwork in the globally renowned COMMFFEST art and film festival, displaying samples of art in Toronto Metro Hall and St. Lawrence Center for the Arts in Toronto. Qn. Can you tell us a little about your success to date? Bardia: We are proudly on the vendor list of one of the top insurance companies in Canada. This large corporation’s communications representative approached Kodatex in 2015 at the time they were renovating their Toronto office due to re-branding. 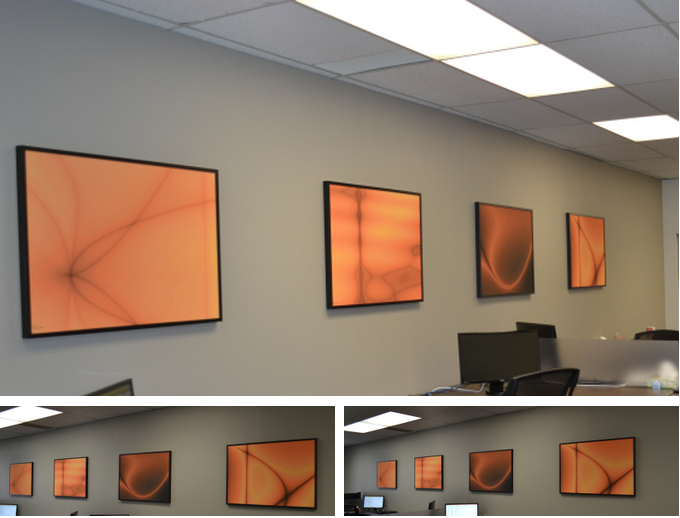 The company was looking for merely abstract artwork that can be produced in a series with similar colour patterns. The company was rapidly conducting the changes and renovations and required the artwork to be developed, produced and shipped in only two weeks. 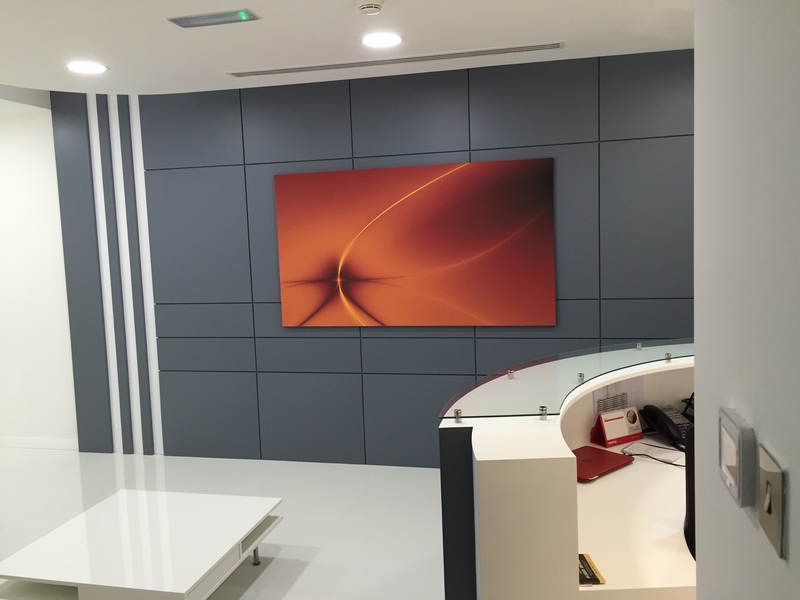 Kodatex successfully created authentic artwork matching the requirements and had them shipped and ready to be installed in the specified timeline. capability to produce high numbers of art pieces in very short time. Our human capital at the moment entails of professionals focusing on optimizing the software and working on the algorithms and as a result, we are aiming to outsource our sales and marketing. A sales agent with strong connections and network can utilize our presence in the potential market and clients such as hotels, offices and public environments. Bardia: Interior design is a billion dollar industry; only in North America, the industry had over $15 bn in revenue and the IBIS industry report predicts growth for the industry in the next five years. As the report claims, “the housing market is expected to improve strongly, yielding growth for residential interior designers as existing home sales and housing starts make up ground over the five ­year period. Meanwhile, high corporate profit will enable companies to expand and remodel, leading to improved nonresidential construction and greater demand for commercial interior design.” With the uniques capabilities and features of Kodatex artwork, we foresee a strong place for our products in this marketplace. Bardia: We can confidently claim our products and services are incomparable in the marketplace. Acquiring original and unique artwork in large volumes with a reasonable price is very challenging. We have the ability to create thousands of authentic, high quality artwork in a short time period. Creating high resolution digital art is a time consuming, and expensive task for a digital designer. Kodatex’s automated algorithms can be customized to regenerate a particular piece to any resolution a client requests resulting in various print sizes. Kodatex differentiates its products and services by uniqueness. Every piece of art we create is original, authentic, and will have a sole owner. We will only produce one of each of the art. Qn. What are you plans for the future of Kodatex? Bardia: We are continuously working on developing new algorithms for enhancing the diversity of the artwork we create. We're also working on a cloud­based platform that allows anyone to create and evolve artwork in an interactive manner. Bardia: Kodatex was nominated for the MADA (Made a Difference Award) in the COMMFFEST Art and Film Exhibition in Toronto. Qn. Can you describe the typical sales cycle and process to reps? to hotels, corporations and commercial spaces, and public spaces which use art as part of their space design. The target would be to find venues which require large quantities of art such as newly established hotels or condominiums. After identifying the potential patrons, the agent/s will provide them with marketing and promotional material such as the brochure, link to the website, price list, and upon request samples of artwork (prints). the requirements taken into account. In the case of customized orders, an iterative process will be used by delivering collections of generated pieces in digital format, and asking the client to select the pieces they believe better match their requirements. Upon selection of the desired pieces, we will generate another set of art embedding the chosen elements until the requirements of the clients are met and sufficient numbers of art are produced for their purpose. Bardia: We currently use social media to connect to potential clients across the globe although we enjoy great word of mouth recommendation from our numerous happy clients. Previous Post Earning A Salary Vs Commission-Only - Is It Ever Worth It?